395311 - Economic Valuation of Environmental Flows in Texas U.S.A.
Water is unique among natural resources in the wide variety of allocations: human use and environmental use; direct use / market-good and non-use / non-market good; and as a private good and a public good. The State of Texas has recognized the importance of environmental flows on the economy, health, and well-being of the state and has enacted legislative actions since the early 1800’s. Non-use values reflect an individual’s “willingness-to-pay” for water. Direct use value of water can be estimated in a market-based system by defining the economic worth of water by its price, with price serving as a guide for water allocation among alternative uses. Water is a “private good” when it is viewed as an economic good. Water is a “public good” because the same water is shared by multiple users, for multiple purposes. Regulatory and market-based strategies have been implemented for the allocation of water resources as a private good. Regulatory strategies for environmental flows include: water reserves, water permits, conditions and amendments attached to new water rights permits, water taxes, return flows, and public interest. Market-based strategies include water: markets, transfers, trusts, banks, and leasing programs. This study looked at how economic impacts and values can be estimated for water resources allocated for environmental flows as related to Texas water policy, used case studies to demonstrate examples of how dollar values can be estimated, and described how value and costs can be estimated using various methods. Elizabeth Del Rosario, M.S., Ph.D. Student, Texas A&M University-Corpus Christi. I received a M.S. in Environmental Science in 2016 from TAMUCC, a B.S. in Fisheries and Wildlife Science, B.A. in Biology, and minor in 2013 Natural Resources from the University of Missouri-Columbia. I am a Ph.D. student in the CMSS (Coastal Marine System Science) program, and member of the Marine Policy and Law Group at HRI-Harte Research Institute for Gulf of Mexico Studies. My research focus is in marine policy with Dr. Richard McLaughlin and co-chair Dr. Paul Montagna. My emphasis area is in water resources management, freshwater inflow policy and regulation. ​I am a NOAA Educational Partnership Program (EPP) Center for Coastal and Marine Ecosystems (CCME) fellow. 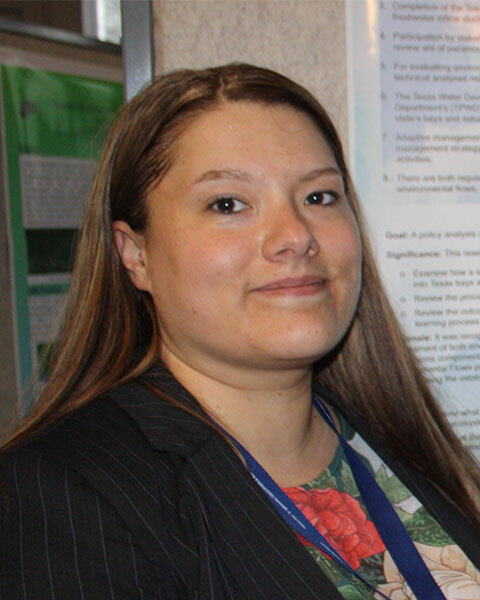 Bio: Elizabeth Del Rosario, M.S., Ph.D. Student, Texas A&M University-Corpus Christi. I received a M.S. in Environmental Science in 2016 from TAMUCC, a B.S. in Fisheries and Wildlife Science, B.A. in Biology, and minor in 2013 Natural Resources from the University of Missouri-Columbia. I am a Ph.D. student in the CMSS (Coastal Marine System Science) program, and member of the Marine Policy and Law Group at HRI-Harte Research Institute for Gulf of Mexico Studies. My research focus is in marine policy with Dr. Richard McLaughlin and co-chair Dr. Paul Montagna. My emphasis area is in water resources management, freshwater inflow policy and regulation. ​I am a NOAA Educational Partnership Program (EPP) Center for Coastal and Marine Ecosystems (CCME) fellow. Send Email for Economic Valuation of Environmental Flows in Texas U.S.A. Title: Economic Valuation of Environmental Flows in Texas U.S.A.